View seaward of healthy-looking, diseased and dead corals at 10 m on the Dairy Bull fore-reef terrace in early May, 2018, Jamaica. Photo by E. Burge. Caribbean-area reef researchers and sport divers should be on the lookout for sites with an unusually high percentage of diseased and recently dead corals. Many of you will have heard that corals in Florida are experiencing one of the largest disease outbreaks on record. Sick corals first appeared offshore the Miami-Dade County area in September 2014. The outbreak area has since progressed 175 km to the northern limit of the Florida reef tract and southwest to Looe Key in the Lower Keys. Numerous coral species (except the acroporids) have been afflicted, disease prevalence has reached 80% of all colonies present at a site, and a number of coral diseases have been observed. 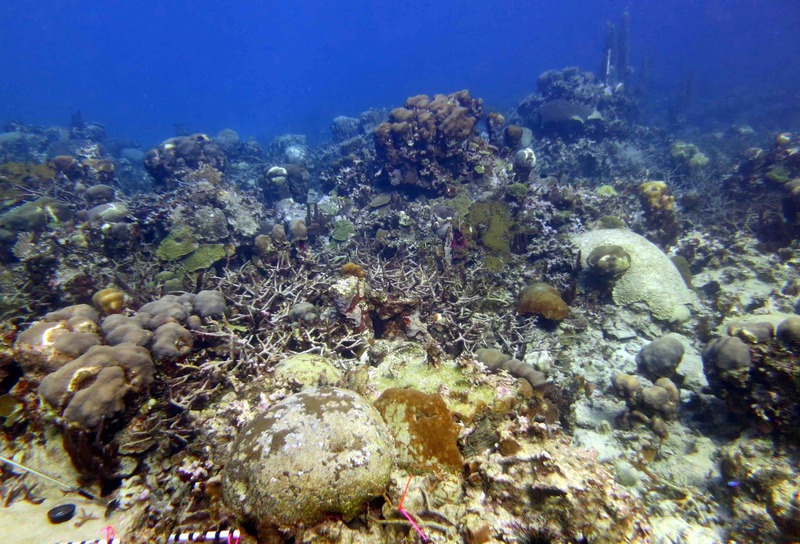 Meantime, the prevalence of sick and dying corals on north Jamaican reefs has increased dramatically since this area experienced a severe bleaching event in Fall 2017. The species of affected corals and their signs of disease show considerable overlap with the reports from Florida. More details and photos of diseased Jamaican corals will be posted at www.agrra.org; permission to collect diseased tissue samples especially from the severely affected Dairy Bull reef is in the process of being obtained by the UWI Discovery Bay Marine Lab. On July 3 researchers from UNAM and CONANP discovered a reef near Puerto Morelos, Mexico to have a severe outbreak of coral disease affecting similar species and exhibiting similar patters as those in Florida. Although diseased colonies have been observed in other reefs in the north of the Mexican Caribbean, the prevalence seems to be lower (<10%) than at the “fish market” site, where >50% of several species are affected. Photos and information about this Mexico site will soon be posted at www.barcolab.org. The Florida Disease Advisory Committee is now referring to all affected Floridian corals as having “tissue-loss disease.” It appears to be water borne and may potentially be spread by divers’ gear. – Please soak your gear in a 5% chlorine bleach solution for 30 minutes, then rinse well. – While diving, please be aware of your fins, and don’t let divers casually touch any of the currently diseased corals or they may transmit whatever is killing them to other corals! Let’s not have reef scientists and sport divers become vectors of disease. If you see any evidence of excessive disease levels on your reefs, please make notes and take photos! – How many corals are infected: (few – some – many; or count sick and unaffected corals to estimate prevalence). – Note the date, which coral species are affected, along with the location, and depth. Please send information to mcfield@healthyreefs.org and jlang@riposi.net – until an official Caribbean reporting site is established or located. Containment / treatment strategies are being tested in Florida; new outbreaks if localized, should be addressed immediately with recommendations that will be posted soon.